Absolutely gorgeous! You do a beautiful job with your soutache designs and the cab is lovely, thanks for sharing your source! Love the pics and story! 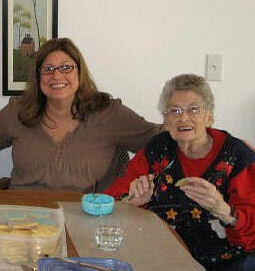 Really beautiful and such a fantastic photo of you and your gramma (you have a stunning smile)! Beautiful! I may have to try soutache... it is sinuous! I like that word. Your Grandma sounds delightful and so full of love! A beautiful story (thank you for sharing your memories and those special pictures too!) with a gorgeous piece! I love everything you made - but I love this broche the best: bold, rich, warm colours and a perfect technique. Simply beautiful! 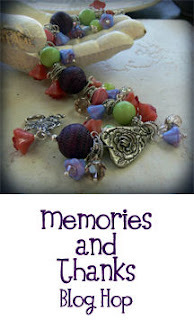 I loved reading about your memories and that broach is gorgeous. I loved the pictures too, especially the one of your 4 generations. No wonder you are so creative and talented; what a lovely legacy she gives to you. Great choices in design for this. Good job. So many happy memories for you. Love the brooch. Good for you, trying your hand at soutache. Looks like you have mastered it well! 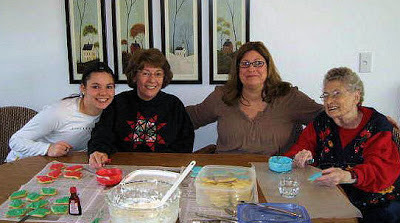 Gorgeous - the brooch, the memories, and the four generations of smiling faces around the table! Your brooch is stunning, and am sure Grams will always treasure it. Thank you for sharing your wonderful memories. What a beautiful piece! I'm sure your grandmother will love it! Gorgeous....I love red just like Gramma! The soutache is lovely. OOOOOOOOO! I love it and I love YOUR style, and your delightful Gramma! I think I'm jealous of your Gramma!! How I would have loved to grow up with her! Gorgeous brooch!! Loved reading your story, seeing pics of your family, and the beautiful red brooch! You always do such lovely work! Gramma Blanche sounds like an amazing woman! You are blessed to have such a wonderful grandmother with whom you can still create memories. Your brooch is stunning, and I imagine it's now one of Gramma's favourite pieces of jewellery. Your brooch is fabulous, just like your Gramma Blanche. I love the 4 generations picture! Beautiful! Your story reminded me of my grandparents - I would stay with them almost every weekend until I started high school. They were so good to me in every way. Thanks for the wonderful post. Outstanding. I love your piece. Thanx for sharing. I also appreciate your soutache tips, I'm thinking of trying it. The brooch is beautiful (soutache is one of those things I want to explore, and you've inspired me! ), and the stories of your Grandma Blanche are great. My grandmother was named Blanche also -- it's a name for very special ladies! A beautiful brooch in honour of your grandma, I'm sure she will love it! Gorgeous soutache, maybe I will have to try again because like you the first time was really hard. Yours turned out truly stunning. You should try again. I really didn't like it - it wasn't easy and it didn't look right - the first time. It gets much better! What a great tribute to your grandma! I love your brooch, it's gorgeous! What a lovely photo of 4 generations of women! Your brooch is beautiful and a wonderful tribute to your lovely Gramma. What a fun way to spend your childhood in a ceramic shop. My grandfather owned a shirt store in Philadelphia and I spent a great deal of time there. Your piece is exquisite. Thanks for sharing your lovely pendant and memories of your grandmother.